So you are in the market for a new laptop huh! Well, whether you want to build one or buy one or whether you have a really good idea of what you specifically want or you have no idea. This post aims to help pretty much everyone by going over what Things To Know Before Buying a Laptop or laptop buying guide and looking for parts or buying an entirely new laptop prebuilt right off the shelf. Because both are valid options depending on what you are going for and you probably already know what you want to do so am not going to try to convince you to do one or the other. Let’s get into what you should look for in that laptop itself! But there is also other stuff that isn’t really related directly to the physical part of the laptop. The first thing to look at clearly is the CPU, it is the brain of the laptop. But what most people look at is whether it is like an i7 or i5 or an i3. Well, they just happen to know that i7 is the best type of CPU, or even if you are looking at AMD. There is the Radeon 7, Radeon 5, kind of corresponding to Intel’s. But a lot of people don’t really consider that well, it is just not i7 or i5 as if they are the same exact CPU. Because not only are there different years of i7’s but there are also different models of each CPU within each year’s i7 line! Well, you can just say, this has an i7 and that is going to be equal to all others. You are going to want to look at which i7 that is specifically and compare that on Intel or if it is a Radeon 7, on AMD’s website. See how that stacks up against the other CPU’s in that line and maybe you don’t know a lot about the individual little specs of the CPU. But you can at least get an idea of where that CPU stands and whether it is justifying a high price compared to another laptop right next to it on the shelf that cost $500 less and it is just one step down. So that is something you want to look at: the CPU, model of CPU and really looking into that and don’t just say oh well, it’s an i7 and it must be the best. Next has to do with RAM and we are not just going to talk about the amount and we are not even going to just talk about the frequency but we will talk about the amount first. So obviously, 4GB is probably the absolute bare minimum you will want in a laptop. I will recommend at least 8GB of RAM and that will pretty much cover anyone’s typical usage. If you are going to be using high-end gaming or want to do video editing, or something a little bit more than standard usage, I will say. If you can, bump it up to 12GB or 16GB and if you need 32GB, you will definitely know it. So anything above 16GB is probably overkilled unless you have a specific reason for that. Now as for Frequency, yes! That is something you need to look at but a lot of people forget about another very important equally important actually spec. Which is the Latency of the RAM. They go hand in hand, Frequency, and Latency because you can have a very high frequency but that also means that you are going to have higher latency and a lot of times this may actually cancel each other out. So rather than trying to explain the relation between latency and frequency and spending the whole discussion on it, I will put a link to another article on my old blog where I talked about what latency is and how it relates to frequency and everything you need to know because it is actually something that is very essential. It will save you money because most people don’t really know what latency is! It is just important as frequency and if you don’t know what latency is, and you could be spending more money on something that is not better. But I will say if you go for high frequency all the time, you probably going to be overpaying because that is what people think is worth more money. They are going to be paying more money and then manufacturers charge more but you can probably save more money by going with low frequency and lower latency RAM and get just as much performance for cheaper. I will hope you know whether you are buying a Pc with Windows or MAC but I don’t know, am not going to assume anything. But obviously there are different editions of windows, there is Pro, there is Home. If you don’t know the difference between what Home and Pro are, I will just get Home! You won’t really use Pro but the one thing to watch out for! I made another post about talking about this Windows 10S that Windows came out with, don’t get that, don’t get Windows 10S! It is garbage, just trust me on that one. If you are going to be buying a prebuilt laptop, one thing you want to look at is what bloatware is pre-installed on there. For storage, whether you want are going with an SSD or hard drive. I will say always get an SSD if you can. There is really no reason to go for HDD on a boot drive especially. If you are going to be storing a ton of data and you know that, I will get an SSD for your main drive and install your programs and then yes get a big giant HDD for all your data but SSD’s are years ahead of HDD in pretty much every way especially. if you have a laptop and the reason are numerous for this mostly because if you have a laptop, that is going to be moving around a lot. An SSD has no moving parts which are why it is called a solid state and a hard drive does! It is spinning platters, the arms moving back and forth even having it sitting on your laps. That’s going to introduce a lot of movement even though it is a 2.5-inch drive where it is going to generate less heat, might last a little bit longer than a 3.5-inch drive. Then, you want to go with SSD which is more adorable, which is even more important for a laptop which is prone to be tossed or dropped when it is running. Not to mention that a lot of times, if you go with a regular hard drive if you are on a laptop, it is going to be a 5400 RPM drive especially if you buy one prebuilt and that is going to be way slower than a standard 7200 RPM drive on a regular desktop. So you are going to be not only slower than an SSD but you are going to be slower than a regular typical hard drive you will see in a desktop. So, it is like there is no reason not getting an SSD on a laptop and even on a desktop, you want one just for the durability and speed is so much more. Finally for the core component that you have to look at is the graphics card. Am not going to get too in-depth into the specs of that because when it comes to graphics cards, typically if you are going with the latest generation, you know, the more you pay the better. You are going to get and just get the best one you can afford but you want to look at the outputs and especially on laptops this is important where you might be trying to hook tv up to it. So I will recommend getting something with an HDMI and also display port because a lot of monitors these days are supporting display ports either exclusively. But if you want the best quality, display port right now is probably the best connection but you won’t really see that unless you are on a Mac but they do exist on Pc. Now the next thing you want to think about is whether you need an optical disk drive but anything you can do with a disk drive these days, pretty much all modern laptops allow you to boot off of thumb drives which it makes them a lot more sensitive. They are rewritable, you don’t have to burn the disk, they can hold more. So honestly, these days, I don’t even think you need an optical drive unless you have a specific reason unless you know you are going to be installing windows off of a disk, then for some reason, you don’t want to use a USB optical drive. Now the next thing you got to consider is what type of connections this laptop has. So not just USB but also Ethernet! What kind of speed has the Ethernet port? I will definitely not get anything that isn’t 1000mbps. As for Wi-Fi, I think everything should have 802.11ac Wi-Fi by now. If it doesn’t, that could be a red flag and it could be like an older laptop that has been sitting on the shelf for a while. One thing you could look for is the upcoming Wi-Fi standard: ax or even ah. However, those have not been finalized, so they are not necessarily at all, it is probably really hard to find something with ah or ax in them at all but if you do happen to stumble across a motherboard with a Wi-Fi antenna or a laptop that does mention either ax or ah Wi-Fi, then you know you are getting something that probably is bleeding edge, it must be pretty new and is something to look in a little bit more. As for USB, the latest thing, of course, is USB type C and there is also USB 3.1. Now, those are not mutually exclusive! You can have USB C that is not USB 3.1 and of course, sometimes USB 3.1 is just a regular USB. But I will say, if you do see a laptop with USB C, or a motherboard with it, I will consider a plus because I think a lot more phones specifically android but even other devices are going to be starting to use USB type C as the standard and it will just help to have that connection so you don’t need to use some sort of special converter. So those are all the main specs that you will expect but what else is there to look for! And one thing will be security features specifically one to see is if the laptop has a TPM: Trusted Platform Module and this is going to allow you to use some encryption features built into windows and other features. It is basically a hardware chip that can generate encryption keys, store them in a way where it is just more secure, so if someone steals your laptop, tries to boot up, it going to be a lot harder for them to break in if the security keys are stored on a special chip as opposed to the hard drive. They are not going to be able to get in if that laptop is encrypted. Another thing to look for is if the specific SSD in that laptop has hardware encryption. This is a higher end feature, so if you are buying something off the shelf, unless it is like a workstation, you might not see this! You really have to look at the specific model of the SSD but a lot of times, higher end SSD’s will have hardware encryption that is a feature that will literally encrypt everything on the fly and will not degrade the performance. So obviously there is Bitlocker for Windows where you can encrypt the hard drive and the operating system will encrypt and decrypt data as to being written to the drive but if your hard drive actually supports hardware encryption, that means it has a special chip on it that is going to be encrypting and decrypting before it even gets to the operating system, so there is not going to be any degrading in performance and I will highly recommend that because it is extremely secure with really no downside, but it will cost you a little bit more. Now, one more thing you are going to want to consider kind of indirectly related to the hardware is how upgradable this particular Pc is that you are going to buy. Now if you are going to be building the Pc, obviously this doesn’t really apply but a lot of times I have seen typically lower-end consumer Pc’s that have very strange internal configurations that are, I guess proprietary that makes it very difficult to even open up or figure out where everything is and you have to unleash weird things! It just looks very strange but if you have a Pc that is open, you know, it is pretty standard, everything has good cable management and it looks like if you wanted to replace a part, you could just pop it out, put it back in! that is a plus because perhaps, you see all the specs on here and there is maybe one thing that you don’t like, like there is not enough RAM or maybe the graphics card is a little bit out of date and it will just be cheaper to buy a new graphics card than it would be to buy another prebuilt that is more expensive with the better one. All those things would be a lot better if you just want to upgrade it and this should also be helpful if maybe you do go with a laptop that is may be last year’s model but it is still really good and again there is just a couple of things you could upgrade and it will be cheaper than buying the latest and greatest right off the bat. This is especially so for laptops which obviously a laptop you can really expect to be that upgradable but I will at least hope it allows you to swap out the RAM and the hard drive. Those are two things that the laptop should let you replace and maybe even add to, checks if there is extra space for an empty slot of RAM, so maybe it has enough but later on you want to add more, you can add more without having to buy a whole new set of RAM and having to get rid of the current one. Yet another thing you need to look out for is having to do with the CPU but not the CPU in the laptop but now rather what CPU’s are coming out soon. This is something you will have to do a little bit of research on and hopefully, you are doing research anyway if you are going to buy a laptop but definitely be aware of Intel and AMD’s upgrade cycle. So you might see that the laptop you are having an eye on or even if you are building the CPU you have your eye on, you will see that it might be a particular generation and it might be the latest, but if you look at press releases, then you look at some rumors and other things that suggest that Intel is going to be coming out with, I don’t know, they might be coming out with a new processor line the next month or the next two months and obviously, you are never going to be able to keep up because they do release it a couple of times a year, some sort of upgraded processors. So don’t worry about if you don’t have the absolute latest, but also keep in mind that if they do release a new processor, then it might make the previous ones cheaper. So you might want to just wait until they drop the new processor if it is going to be pretty soon and then pick up older ones cheaper or get that new one right off the bat. And of course, that same thing is going to go with particular GPU graphics cards. I don’t think there are release schedules for RAMs as much, but definitely for CPUs and GPU’s. Of course, one thing you can’t forget about is the warranty. Yes! You hope it is not going to break and a lot of people kind of ignore the warranty just because they assume, if they buy something, it is going to work but it is something to look at. Another thing you want to look for the kind of relate to this is specifically if you are going to be buying a copy of windows like if you are going to be building a Pc, you want to decide whether you want to get an OEM or a regular copy of windows. And the difference is, OEM copies of windows are going to be cheaper and the OEM stands for: “Original Equipment Manufacture” and those are basically the kinds that are installed by like Lenovo, Samsung or whatever manufacturer making the Pc and that means, they are going to be responsible for the support of the laptop. So if you are not buying from one of those manufacturers but you are buying an OEM disk – Yes! It is going to be cheaper but that kind of means you are on your own and Microsoft is not going to be obligated to really support you because you bought an OEM copy and it is cheaper for a reason. Whereas if you buy the full price regular version of windows, then that means there are a little bit more obligated, you might get better support for it. 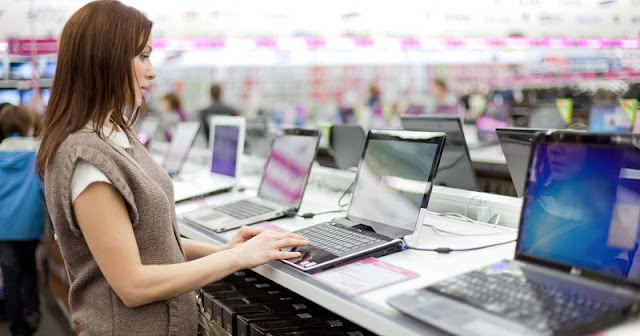 So that is just some things to know before buying a laptop to keep in mind. Am not sure how much of true that is these days, but am sure there is a difference because there are still OEM versions out there. So I think that should cover everything, we went over very basic stuff and a little bit more advanced stuff for people building it but hopefully everyone got a little bit more information that should be helpful the next time you are going to get a new laptop and upgrade. If you guys enjoyed this blog post, be sure to let me know down in the comments section.